Class A Circuit – Instead of capacitor coupling, a Transformer Coupled Class A Amplifier may be used to ac couple amplifier stages while providing dc isolation between stages. The resistance of the transformer windings is normally very small, so that there is no effect on the transistor bias conditions. 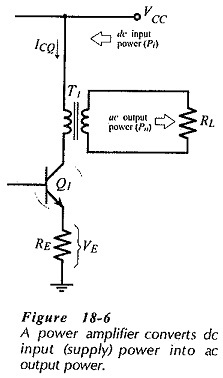 Figure 18-1 shows a load resistance (RL) transformer-coupled to a transistor collector. The low resistance of the transformer primary winding allows any desired level of (dc) collector current to flow, while the transformer core couples all variations in IC to RL via the secondary winding. This circuit is an emitter current bias circuit with voltage divider resistors R1 and R2 determining the transistor base voltage (VB), and resistor RE setting the emitter current level. The circuit in Fig. 18-1 is referred to as a class-A amplifier, which is defined as one that has the Q-point (bias point) approximately at the center of the ac load line. This enables the circuit to produce maximum equal positive and negative changes in VCE. The total dc load for transistor Q1 in the circuit in Fig. 18-1 is the sum of the emitter resistor (RE) and the transformer primary winding resistance (Rpy). The ac load line is shown in Fig. 18-5 to show the effect of an input signal. When the input causes IB to increase from 50 μA (at IBQ) to 90 μA, the current and voltage become IC ≈ 9 mA and VCE ≈ 1.6V, (point C on the ac load line). The changes are: ΔIC = +4 mA, and ΔVCE = -6.4 V. When the input causes IB to decrease (from IBQ) to 10 μA, IC changes from 5 mA to 1 mA, and the VCE changes from 8 V to 14.4 V, (point D). The current and voltages changes are now: ΔIC = -4 mA and ΔVCE = +6.4 V.
It is seen that an IB change of ±40 μA produces a ±4 mA IC change and a ±6.4 V change in VCE. The VCE variation appears at the primary winding of transformer T1, and the IC variation flows in the primary winding. Note that, although VCC = 13 V, the transistor VCE can actually go to 16 V. This is due to the inductive effect of the transformer primary winding. The transistor used in this type of circuit should have a minimum breakdown voltage approximately equal to 2 VCC. Power is delivered to an amplifier from the dc power supply. The amplifier converts the do power into ac power delivered in the load, (see Fig. 18-6). Some of the input power is dissipated in the transistor or in other components. This is wasted power. The efficiency (η) of a power amplifier is a measure of how good the amplifier is at converting the dc input (supply) power (Pi) into ac output power (Po) dissipated in the load. the case of a class A amplifier, Iave = ICQ. In a practical Class-A transformer-coupled power amplifier circuit, 50% efficiency is never approached. 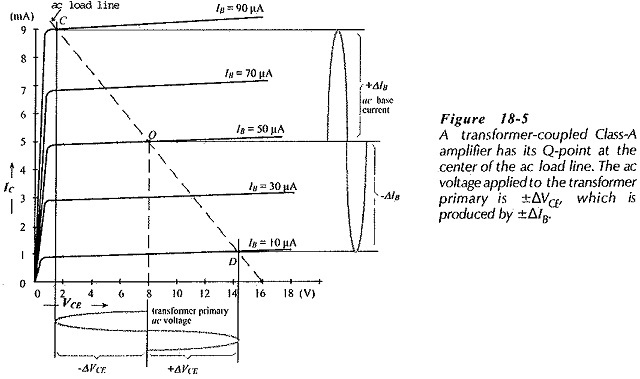 Any practical calculation of power amplifier efficiency must take the output transformer efficiency (ηt) into account. A typical transformer efficiency might be 80%. There is also power dissipation in the transistor emitter resistor and in the bias circuit. The practical maximum efficiency for a Class-A power amplifier is usually around 25%. This means, for example, that 4 W of dc supply power must be provided to deliver 1 W of ac output power to the load.